Maybe Minecraft isn’t the first thing you think of when you’re prepping for Christmas crafts…unless you have a young gamer in the house! Since Mitch has me hooked on Minecraft, I’m always thinking about creepers and Steve when I’m ready to break out the glitter and glue! Pixel Paper Craft is my favorite website for free Minecraft printable toys. It’s full of user downloaded designs for 3D models of mobs, characters and blocks! 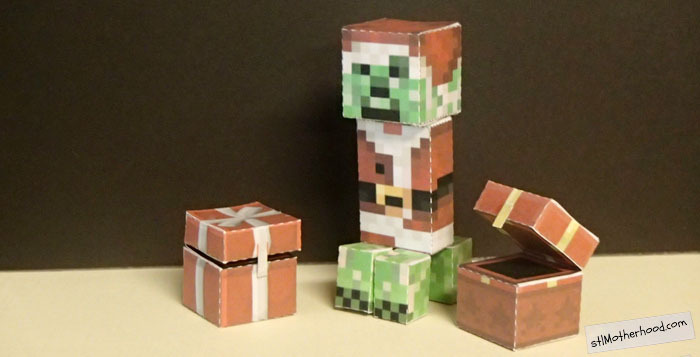 I was able to find several Christmas themed mobs that Mitch was excited to make…Santa Creepers, holiday chests, blocky gingerbread men and even a simple Creeper ornament. To use Pixel Paper Craft you just need a color printer, paper, scissors and glue. For best results use heavy card stock and tacky glue. Some simple models, like blocks, can be stuck together with just double sticky tape. I cheat and use my Silhouette to do the cutting–but I made plenty of these before the electric cutter came along. 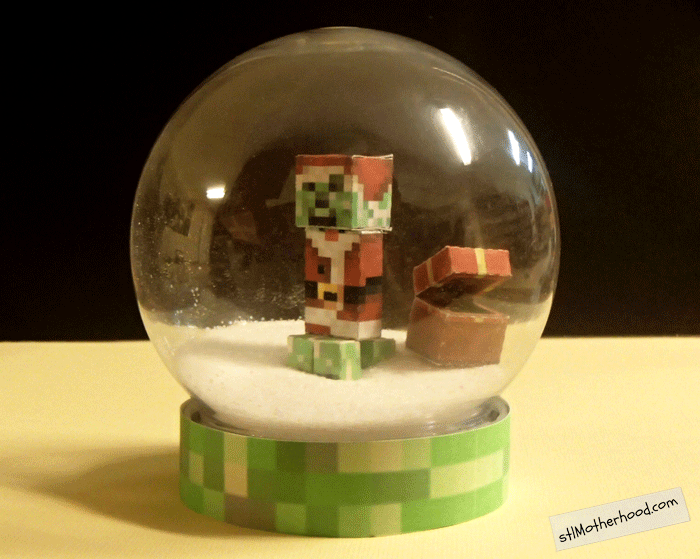 For added holiday fun, try putting your Minecraft paper models in a snowglobe! We found ours at Michael’s. Since paper creations can’t hold up to the normal water/glycerin/glitter combo, you’ll want to make a DRY snowglobe. Glue your decorations to the bottom of the snowglobe (or mason jar lid) and add salt and a little glitter to represent snow. It’s not quite as fun to shake up, but it does look pretty nice. One this on, we glued down the creeper, but not the chest. 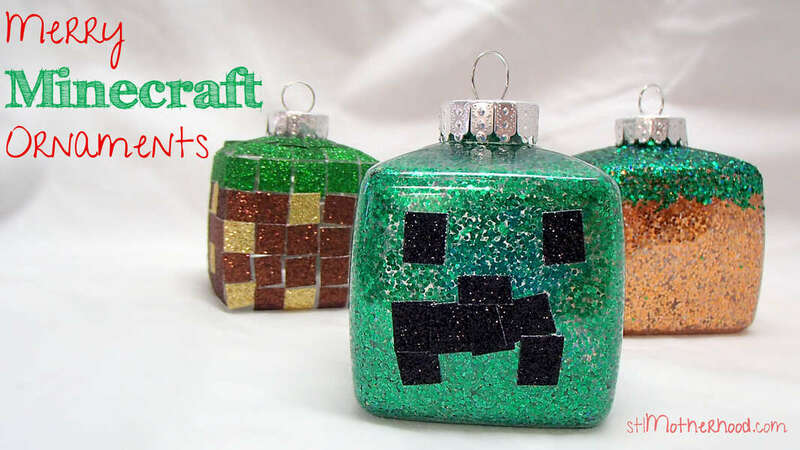 We made these Minecraft ornaments using square plastic ornaments found at the craft store. Mitch had a lot of fun decorating these with glitter tape, see the full directions here. 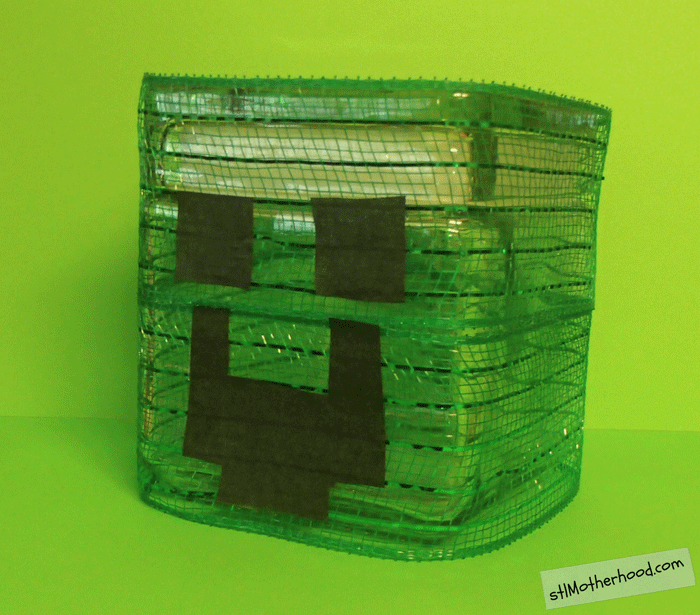 The creeper face is made with green glitter on the inside and black tape on the outside! Every now and a again I prowl around the craft store looking for anything SQUARE that I can turn into a Minecraft craft with Mitch. I found this square glass jar, which we decorated with green mesh ribbon. The ribbon is tacked on the back with hot glue. Mitch made a “happy” creeper face with black tissue paper and stuck it onto the jar with double stick tape.